alaTest has collected and analyzed 13 reviews of Denon D-M39DAB. The average rating for this product is 4.9/5, compared to an average rating of 4.1/5 for other Audio Systems for all reviews. We analyzed user and expert ratings, product age and more factors. Compared to other Audio Systems the Denon D-M39DAB is awarded an overall alaScore™ of 89/100 = Very good quality. 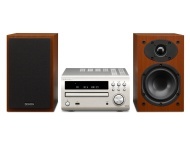 alaTest has collected and analyzed 2 user reviews of Denon D-M39DAB from Amazon.co.uk. The average user rating for this product is 5.0/5, compared to an average user rating of 4.2/5 for other Audio Systems on Amazon.co.uk. Easy to set up, particularly the sound adjustment. Great sound quality. I bought this system to replace an older item .It is very neat and fits well into my decor .the sound is very clear and it was easy to set up .